Web Cam – Lake quickly freezing! MCHENRY, Md. 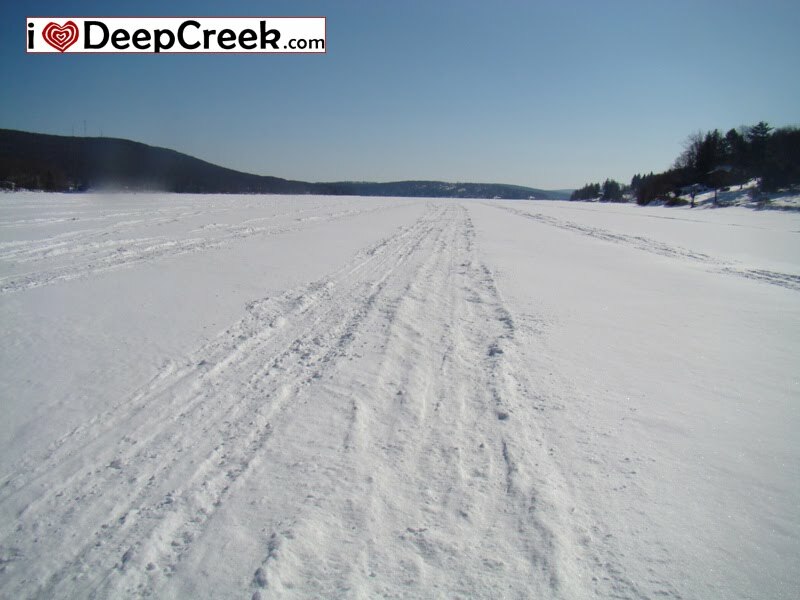 — The Maryland Department of Natural Resources is urging people to be cautious when venturing onto the frozen surface of Deep Creek Lake near McHenry. The agency said Friday that snowmobilers, anglers, hikers and cross-country skiers should wear personal floatation devices in case they end up in the water. Snowmobiling is allowed on the lake by those who have obtained permits, available by mail or at local state park offices. Snowmobiles may operate at night if equipped with working head and taillights. Snowmobilers can access the lake at Deep Creek Lake State Park or with permission from private landowners. My daughter, Kayleah, and my wife, Jessica, were with me today as we ventured out on the ice at Deep Creek Lake. From what the ice fishermen were saying, the ice is about 12 inches thick on the main body of the lake. Our first experience was near Ski Harbor, and we were surprised to see ‘Logan’, a beautiful yellow lab, come sprinting from the Lakestar Lodge. His owner was right behind him, but the dog had no idea he was on ice the way he sprinted towards us with his tail wagging. Next, Kayleah and I ventured out a little further on the ice in front of Traders Landing and High Mountain Sports. You could see that there had been plenty of snowmobiles leaving their marks on the ice and snow. Kayleah made a heart in the snow and it turned out to be a great picture, as you can see. It was FREEZING with the wind chill, so we only stayed out for 15 minutes or so. Overall, FUN DAY!